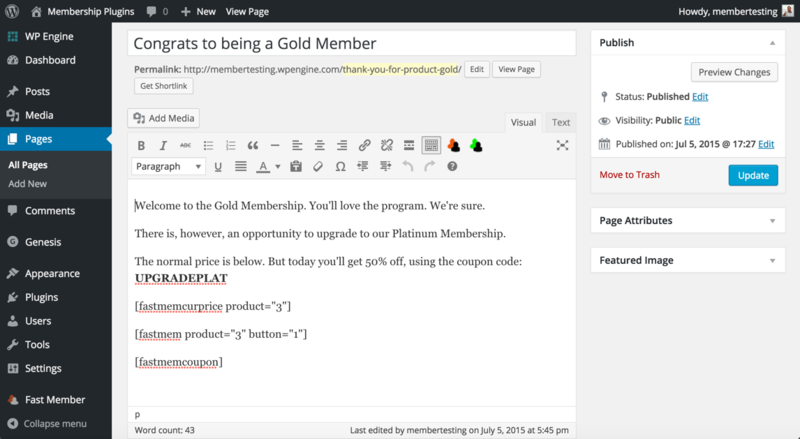 When you look at membership plugins, you find that some come from within the broader WordPress community and look to serve the community, and others come from outside and look to support those outside of it. Neither is better than the other. They’re just different – and you can tell by looking at the features and integration partners they focus on. 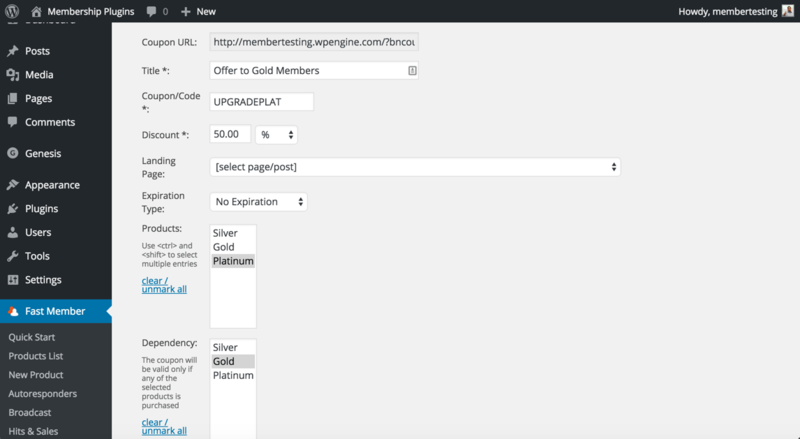 If you didn’t know, this is the fifth in a month-long series on membership plugins: Membership Pro 2, WP eMember, WP-Members & Restrict Content Pro. I’ve told you before that a “Get Started” wizard is a great idea. I’ve also told you that I don’t love plugins that automatically create pages for you. But the way FastMember does it is different, and very helpful. The @FastMember plugin creates pages for you, in a helpful way. Take a look at this four step wizard. It’s designed for people who don’t do this often. Step one in the process is to let you decide what kind of site you want to build, using FastMember. You have several options. Obviously, for our purposes, we’d choose a membership site, but the nice thing is that you can use this plugin for more – from digital downloads to online courses to multi-level membership sites. I created a simple membership site that would last six months, charged monthly. I’ll come back to the idea of three levels later. But for now, let’s walk thru the rest of this wizard. I then see options for the sales pages and thank you pages. In this case, based on what I’m going to do, I picked separate for each. FastMember comes with support for affiliates baked in, but I chose to skip it. I picked PayPal, but there are others – including Authorize.Net, and Stripe (via extension). I also enabled coupons (which we’ll see I will use immediately). What they do is create all the pages you need (sales pages, product pages, and thank you pages) with all the shortcodes already in them. Why is this better than the other ways plugins create pages? FastMember isn’t trying to create system pages (like registration, store, etc). It’s creating pages specifically for your products. And it fills them with the shortcodes you need, along with baseline text telling you what each page is for. It names these pages descriptively so that, as a user, there’s no way you don’t know what to do next. In essence, this plugin walks you thru each step in the creation of your site. Better than most plugins that expect you know what to do next. Like I said, this plugin has been built for the kind of audience (internet business owners) that don’t know much about all this. So it helps them take lots of tiny baby steps. If you’re looking for a membership plugin that guides you step by step to build that kind of site, you will likely really enjoy @fastmember. I’m not much of a fan of shortcodes. This is a personal feeling and probably not worth much to you. I get that. But it’s my personal bias and worth noting as I review a product. FastMember uses a lot of shortcodes. So you might think I’d feel negative about the plugin with all its dependencies on shortcodes. But here’s the thing. I don’t really like shortcodes when they’re doing style, layout, and visual things (like columns of text, drop caps, and more). 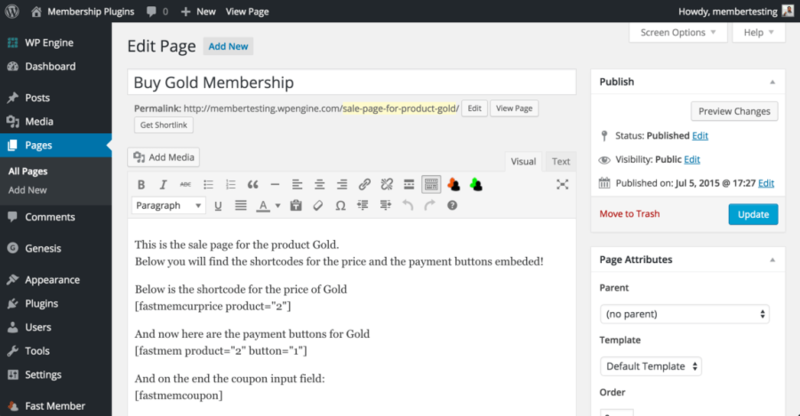 When it comes to integrating features into posts while giving the user flexibility, shortcodes makes sense. Let me give you an example – the one I worked on when building my sample site with FastMember. I decided to create a single membership program (not three) that would offer the “Silver” membership for anyone who wanted it. But if you paid for that membership program, I’d offer you (at the time of your purchase) an upsell to the Gold program (with a discount). And if you bought that, I would make one last offer to sell you (with a discount) the Platinum program. These are called one-time offers (OTO), and FastMember supports them easily (because of the use of shortcodes). You can easily create one-time offers (OTOs) with @FastMember and their shortcodes. Remember when I created separate sales pages and separate thank you pages? Well, now that becomes useful, because I can take the content of the Platinum sales page and put it in the Thank You page of the Gold level. The result is that every time a person purchases something, the thank you page offers them a one-time offer (OTO). And I can even sweeten the pot with a coupon to reduce the price for this OTO. Notice I use the shortcodes to put the price tag, the buy button and the coupon field all on the thank you page. The coupon code is articulated because I’ve already created it via the coupon section of the plugin. It gives users of the code 50% off. But notice it’s only for people who own the Gold membership already and are buying the Platinum. No way to mess things up. Notice I’m able to create this entire flow without any coding! FastMember supports dripping content out to members over time. It’s something that used to be hard to find and now is a feature many plugins support. But few make it as such a core part of their plugin as FastMember. Where many plugins give you a place to create a set of drip rules, FastMember puts the option on every page. So since I had created 6 pages per membership, I wanted the content to be spread over 6 months and that meant a 30-day delay for each page in each membership level. 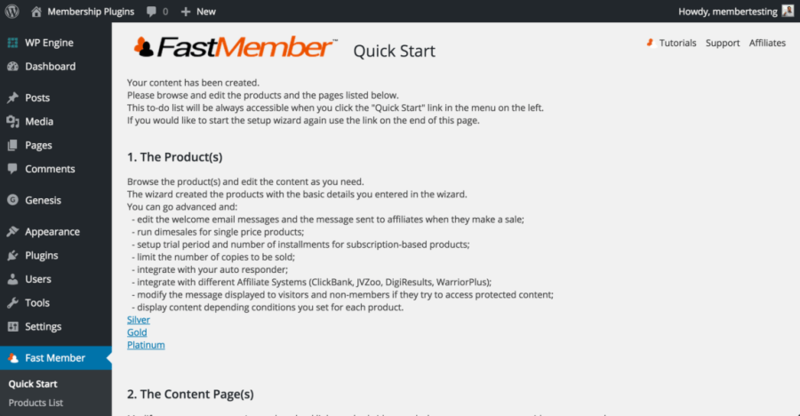 I started this review by telling you that FastMember was built by folks outside of the “WordPress Community” and was built for those outside it as well. How do I know? Well, people inside the community (and I’m making a generalization) have a particular way they go about sales. They don’t spend tons of time on long sales page letters or video sales letters. They don’t do things like dime sales. A dime sale is a kind of one-time product charge that changes as more and more people buy a product. It starts going up as more people purchase it. Imagine you sell a PDF eBook that you start at $1. But for every 10 people who purchase it, you change the price by $1. So if 100 people buy the product, it’s now $10. And up it goes. You see this a lot in certain online circles of internet marketers. And because you see it, guess what? People want it in their products as a feature. But most developers I know don’t put that feature in their code. Notice you can also put a “copies left” count so that you can create the scarcity that might drive sales. 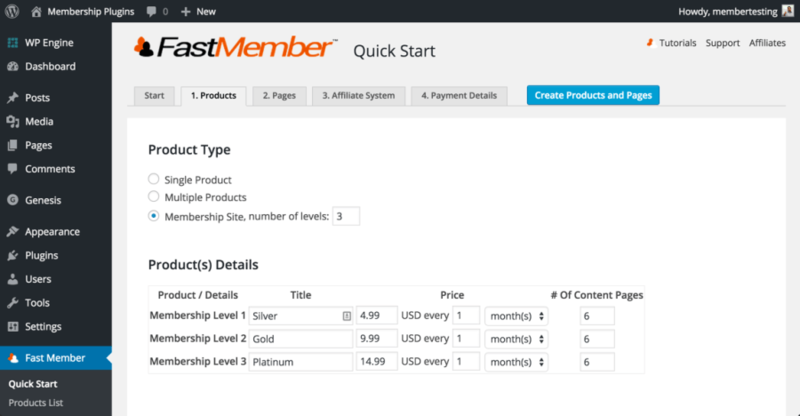 FastMember steps into a space (sales & marketing) that most membership products don’t. 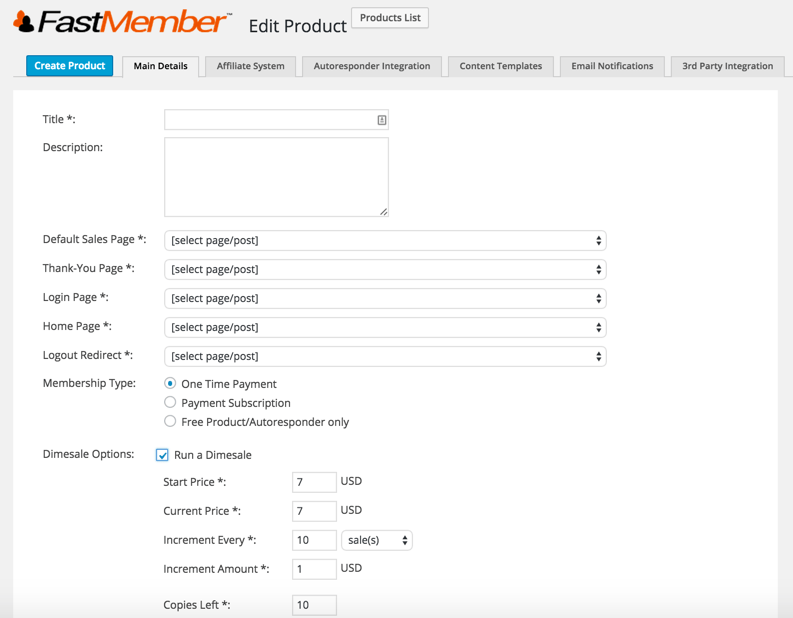 I remember the first time I saw a membership plugin create a pricing grid (MemberPress) and was surprised to see it there. It’s the reason non-developers like love FastMember. Because it helps them in another area (beyond code) that they struggle with (graphics). The @FastMember plugin takes care of more than code. It helps with graphics. Take a look at several pre-created and pre-ready graphics. They’ve created all these images in different sizes and different colors. And created a simple way for you to build them and use them. You fill in the blanks and pick the button and you’re ready to create a shortcode for your page. Because FastMember doesn’t really play in the space of other WordPress products, it doesn’t do a lot of integration with plugins like BBPress or BuddyPress. It doesn’t try to integrate with other solutions because it’s trying to be a total, all-in-one solution for an audience that may not even know of those products. It doesn’t support self-service approaches to membership pausing but it does allow the administrator to do all sorts of things like pause a membership, manually add a member to a membership level, and even move them forward in the drip schedule. So let’s get to the score.